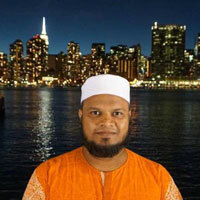 Imam Muhammad Shahidullah | Institute for Peace and Leadership, Inc.
Muhammad Shahidullah, a successful media and interfaith scholar, youth icon and organizer. He is the son of late Osman Ali and Jobeda Khatun. Later, he completed his Alim and Dakhil from Barisal Sarsina Madrasah. Shahidullah completed his Honours and Masters degrees in Islamic History and Culture with first class first from University of Dhaka respectively. At present he is serving as an president of interfaith center of south Asia and Assistant Professor of Jagannath University. However, Shahidullah is the Director of ITV, a New York based American Television Channel, and Consultant of Daily Alokito Bangladesh as well. Interfaith Leader Shahidullah’s life is full with success and endeavor. He is a guest teacher of Ahsania Mission Institute of Sufism, a teacher of Dawah of American Muslim Centre, religious programmers presenter and news coordinator of TBN24 TV, an International Affairs Secretary of Centre for Human Rights Movement, also an International Affairs Secretary of Poribesh Bachao Andolon (Poba) and Interfaith programmers coordinator of Radio Today 89.6 FM. In addition, he is a former Lecturer of Asian University, was a Religion Editor and Pathokmela Editor of Daily Amardesh from 2004 to 2008 and maintained his duties as an Assistant Editor of Daily Destiny from 2011-12. At present Shahidullah is running the Islamic programmers’ of different television channels as a presenter as well as an orator like Banglavision, Rtv, Gtv, Channel24 and Boishakhi Television. Muhammad Shahidullah is a multi-talented person thus we can see him as a writer, journalist, teacher, television programmer and an environmentalist. In 1993, his first writing was published in Sarsina Madrasah souvenir. Later, he wrote up in National Dailies and various Research Papers as well. In the field of writing books, concatenation and editing both in Bengali and English Muhammad Shahidullah is a foresighted one. Among the books Islamic History (570-750), Religion of Peace, The Alem Society in Liberation War, Peace and Human are the best examples of his writings. He has been awarded different prizes for his contribution. In 2001, he got Special Award in Journalism from Netrakona, won Brigadier Dr. Muhammad Yunus Gold Medal in 2006, Islami Journalism Award in 2007, Sadhinata Sangshad Honor in 2009 and Sadhinata Sangshad Education Award in 2010. Instead of these, Department of Environment-Government of the Peoples Republic of Bangladesh awarded him Special Award for his contribution. Muhammad Shahidullah has attended more than 50 National and International meetings-seminars and workshops and presented at many International meetings and conferences. Muhammad Shahidullah is the life time member of Islamic Foundation of Bangladesh, Development Forum, Bangladesh Itihas Porishad, Bangladesh UNESCO Club, Journalist Welfare Organization, Sub-Editors Council, Dhaka Journalist Union, History Academy, Book Review Committee of Bangladesh Islamic Foundation and Alumni Association of Dhaka University.